In Given Time, artist Nathaniel Stern utilizes different forms of media, but maintains his focus on the relationship between bodies and art. Given Time is a video installation that uses the 3D social network platform, Second Life, to make a comment on our role in the real world as compared to the online world. 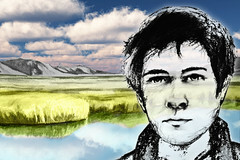 In Second Life, users create an avatar that inhabits a virtual world in a 3D environment. Users interact with one another as they would in real life, only virtually, in a computer graphics setting. Each individual you may come across in a Second Life world is a representation of a real human at his or her own computer, who could conceivably be any distance away from you. For this installation, Stern created two avatars in Second Life who stand apart facing one another. Their location within the in-game world is never disclosed, but they do occupy virtual space somewhere. In physical space, the two avatars are projected onto screens opposite one another in the gallery, as in Second Life. 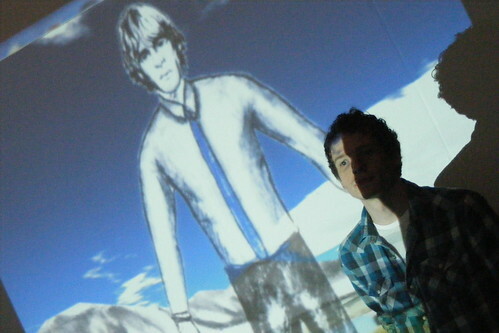 Viewers can approach the two virtual performers, while they hover as video projections, forever staring at one another. These representational characters are in fact, nobody. They exist only in the virtual plane, yet they are brought into existence via light and electricity. 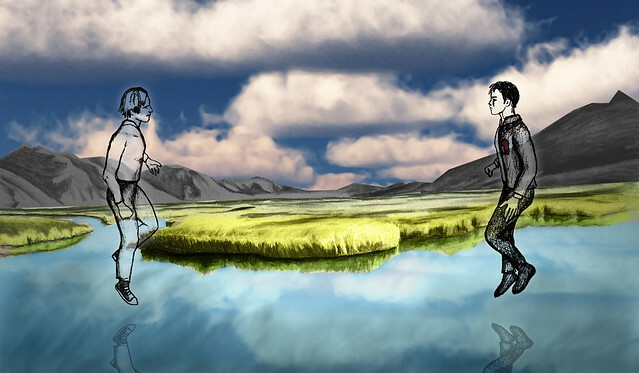 To enhance the tangible effect on the viewer, the characters are given a stylized appearance and ambient noises can be heard in their proximity. Their features and embodiments in Second Life are as real and legitimate as any other avatar in the game world, except they have no real-life counterpart-- no physical representation to their digital existence. Essentially ghosts in the machine, they are present only as electronic impulses and data configurations in a network thousands of miles long. Given Time elicits questions of reality, consciousness, and physical space. The fact that a network like Second Life exists, illustrates the questions and curiosities we have about identity. This piece further probes those inquiries and offers a paradox to reflect on.